…Keegan hits a hole-in-one in its world premiere of Belfast playwright Rosemary Jenkinson’s one act, one actor play about a young golf fan in Cluan, a Protestant neighborhood in Belfast. Cluan is blocked from a nearby Catholic neighborhood with “peace lines” constructed of walls topped by prison-like fences, whose purpose is to keep the neighbors from attacking each other, although projectiles often find their way over the walls. What is it like to grow up in such an atmosphere? For the older folks, it’s undoubtedly better than the bloody civil war that claimed so many lives. But for the young, including Ross, the play’s late teens or early twenties protagonist, brilliantly and energetically played by Josh Sticklin, the uneasy peace has stifled their opportunities. Director Abigail Isaac enhances Ross’s vivid descriptions through technology – recordings of a crowd yelling and burning property, a police vehicle’s lights blinking red and blue behind the stage, the plunks of a golf ball behind the audience, and the insistent buzzes emanating from the curious devices that Ross’s friend’s mother sells for a living. Still, the focus is almost exclusively on the charismatic Mr. Sticklin, whose adopted Irish accent never wavers, and who leaps about on an almost bare stage, telling his story in a mesmerizing fashion that all but convinced me I was seeing and hearing several people. His depiction of an intimate encounter with an older woman is hilarious, as is Ross’s jumping out of bed in the morning and sniffing the dirty laundry strewn on the floor, as he looks for something clean enough to wear for a second day. The play contains numerous funny moments, many of them attributable to Ross’s wisecracks…Yet despite the numerous laughs, this play is no comedy. Ross’s youthful exuberance contrasts with the hopelessness that the Cluan residents feel about their lives, where the peace walls serve as a metaphor for the figurative prisons in which they find themselves. Until the last moments, the audience is left wondering whether Ross will succeed or will go the way of so many other young men in Belfast still caught up in the sectarian unrest despite the peace treaty – to prison or worse. 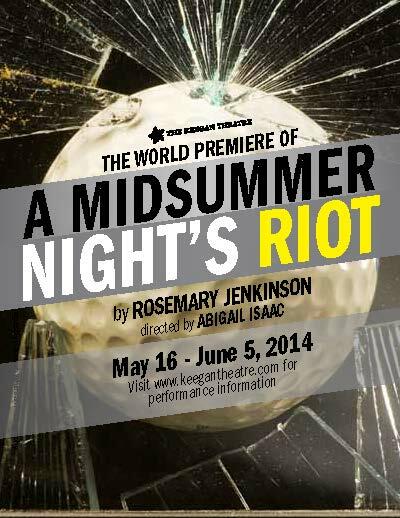 Learn how you can buy Keegan tickets or become a subscriber to see great programming for less.